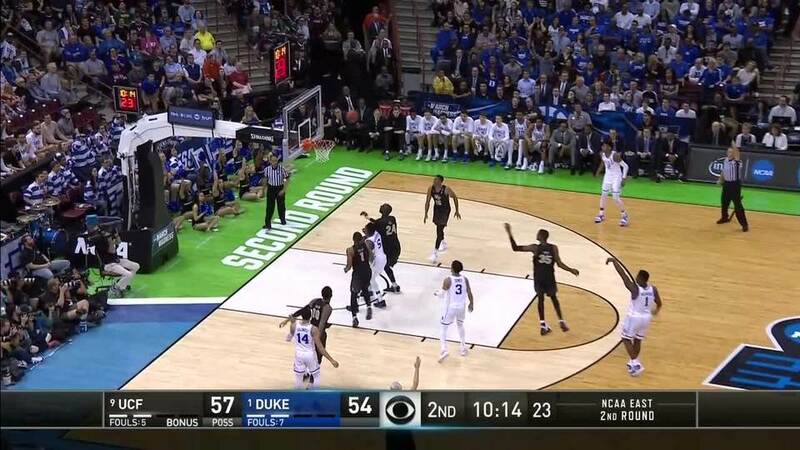 For a few seconds, as the clock ticked down in the second-round game between UCF and Duke, the Knights threatened to upset 39.2 percent of the world's brackets. The Blue Devils spurred stress in every fan picking Duke as a national champion, and they threatened to ruin the remaining perfect brackets left in the country. They nearly lost it. UCF's BJ Taylor put his team ahead by three with less than a minute to go, and the Knights clung to a 76-73 lead as seconds passed. Zion Williamson, in typical hero fashion, raced down the court, looking for the three. He shot for the tie...and missed. Javin DeLaurier couldn't find the net after his offensive rebound, and Duke trailed by three with 15 seconds to play. Could they save the brackets? Williamson, after missing his three just seconds earlier, drove through the lane and fought for his basket and the free throw. Duke trailed by one. The freshman stepped up to the line and missed. But there was Barrett, his freshman phenom teammate, ready with the assist and the win. The two Blue Devils came together again, put the winning play together and sent fans into a frenzy after the 77-76 victory. The game put an a wild twist on Duke's journey to the Sweet 16, but after a battle, the Blue Devils move on. The Knights will head back to Orlando with their tournament journey over, but UCF senior Tacko Fall will still end his collegiate career as a fan favorite. One last Tacko Fall update. After shooting 7-for-10 in his final college game, he finishes his career 497-for-662 from the field, 73.95%. He has broken the all-time career field goal record, (67.75%, set in 1981 by Oregon State's Steve Johnson), by OVER SIX PERCENT. Unreal. Loved the way Tacko Fall competed against the future #1 pick in the NBA Draft! Tacko will always be one of my favorite UCF Basketball players! This is the Madness that March brings every year, and this year is no exception.